MARTIN O’NEILL will let grieving skipper Robbie Keane decide whether he feels able to lead Republic of Ireland into tonight’s Euro 2016 qualifier with Scotland in Dublin. Such a long anticipated clash has been placed firmly in perspective by the shattering news that Keane has lost two cousins over the last three days following an accident in a sewer. Alan Harris died on Wednesday after being overcome by toxic fumes as they worked in a sewer while investigating faulty pipes. Stephen Harris, Alan’s brother, died yesterday in hospital in Dublin, where he had been receiving treatment since the accident, just a few miles from the Irish training base in Malahide. This news emerged shortly before O’Neill conducted a press conference yesterday at a hotel in Dublin airport to preview tonight’s game. These tragic developments dominated an understandably downbeat briefing, where O’Neill admitted Keane, who trained yesterday, has been greatly affected. “It was obviously very bad news this morning, as well,” said the manager. “So he is not feeling great, I must admit. It is obviously very difficult for the family. He is quite down at the moment. I am hoping he will come round. Whether he feels he wants to participate in the game tomorrow, it will be entirely his decision. There was already some doubt over the extent of Keane’s involvement. The 34-year-old striker has played only once for his club LA Galaxy since injuring his groin in April but he was expected to contribute as a substitute at least. Whether Ireland’s record goalscorer features at all is now in severe doubt. Scotland manager Gordon Strachan, who bought the then teenage Keane for £6 million for Coventry City in 1999, extended his sympathies to the player and wondered whether he might be inspired to play in such a crucial fixture in memory of his cousins. Strachan would not be drawn on the news Aiden McGeady is another doubt for Ireland after sitting out training yesterday with a hamstring injury. Strachan will name his side this morning. “There will be four or five who are disappointed,” he said. 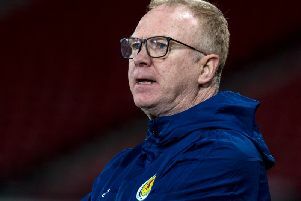 Victory would take Scotland five points clear of Ireland, who are currently behind them in fourth place in Group D. While a draw might also suit their needs, Strachan dismissed the notion the visitors would sit in. “I can’t remember any manager telling me, and I am going back 40 years, that this is the way you play for a draw,” he said. He is, though, prepared for however Ireland decide to approach the game. “I think our last game in November [which Scotland won 1-0] was intense – I am not sure I would call it a battle,” said Strachan. “It was intense in that no-one wanted to give ground. Whether you are 5ft 2in or 6ft 3in you just didn’t want to give ground. But it wasn’t nasty in any way. I think we all agree with that. It was just intense. And I think they enjoyed it.